I recommend that all leaders every so often read the What Will Matter poem by Michael Josephson. It serves as a powerful reminder of the importance of unselfishly serving and leading with character. What will matter is not what you bought but what you built; not what you got, but what you gave. Two years ago, Lynn Flinn of EWF International in Tulsa, OK wrote the following in her business’ newsletter. It’s so powerful I wanted to bring it back again this year as 2012 comes to a close. • Take a personal risk. Tell someone something you’ve always wished you’d said to them. • Write a note to someone who inspires you but probably doesn’t know it. 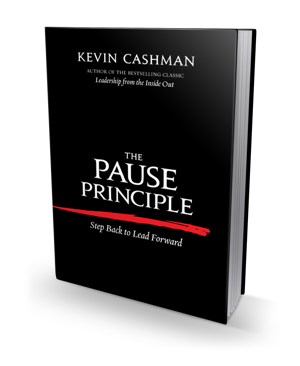 • Pick one characteristic about yourself that you’d like to change and earnestly work on changing it. It is really hard to change a behavior, but it is possible if you are aware, patient and persistent in making a change. • Smile and talk to strangers that you meet. It is amazing how much shorter a long line feels when you are talking to someone versus focusing on how long the line is. • Meditate, pray, relax, exercise, hike, laugh or whatever brings you peace. Some people say they are just too busy to do these things, but taking time for self-renewal shows self-awareness, not selfishness. • Take a trip somewhere that you’ve never been. It could even be a place you’ve never visited in your home town. How many experiences have you overlooked in your own town, because you just keep going to the same familiar places? • Do something meaningful for a non-profit organization. Volunteers are the lifeblood of non-profit organizations. If everyone volunteers a few hours a week, think how much non-profits can accomplish. • Don’t get stuck in the same old routine. Shake it up and do something different. Something as simple as taking a different route to work or going someplace new for lunch makes life a little more interesting. Thanks Lynn for this great end-of-the-year advice. EWF International provides professionally facilitated peer advisory groups for women business owners and executives. 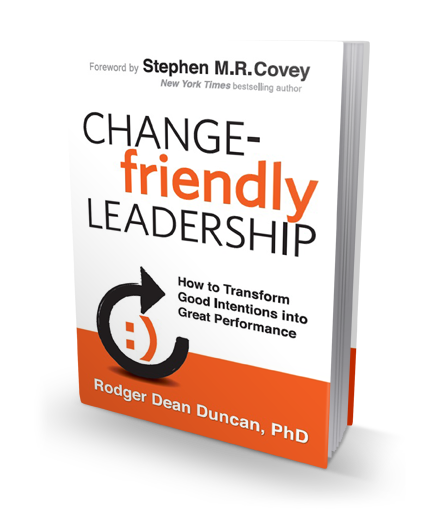 Because Dr. Rodger Dean Duncan delivers so much timely, straight-forward and relevant wisdom in his new book, Change-friendly Leadership, reading it is like talking with your trusted best friend. Or, listening to your favorite teacher. Or, soaking in the thoughts from your respected mentor. Thanks to Cave Henricks for sending me an advance copy of the book. Every year, the Kansas City Business Journal honors 25 women business leaders in the Kansas City metro in its “Women Who Mean Business” awards competition. I’m a big fan of best-selling author Harvey Mackay. He writes about business, sales and leadership and typically ends his articles with a moral of the story. It’s not enough to know how to do things – you must know why you do them. If you live in the past, you won’t have much of a future. If you want to outsmart the competition, you have to outthink the competition. Don’t be afraid to make a decision. Be afraid not make a decision. What you learn on your first job will last through your last job. Minds are like parachutes – not much good unless they are open. If you can’t be an expert, hire one. People have a way of becoming what you encourage them to be. It only takes a little spark to ignite a great fire. Doing the right thing is never the wrong thing to do. 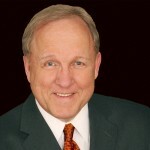 Mackay’s best-selling business books have sold more than 10 million copies worldwide. They have been translated into 37 languages and sold in 80 countries. Swim With the Sharks Without Being Eaten Alive was a groundbreaking New York Times #1 best seller for 54 weeks. The next time you stay at a Marriott hotel look in the nightstand drawer for Marriott’s booklet that highlights its milestones and tells the Marriott story. 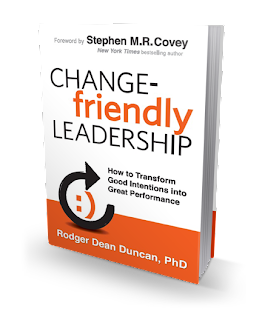 Continually challenge your team to do better. Take good care of your employees, and they’ll take good care of your customers, and the customers will come back. Celebrate your people’s success, not your own. Know what you’re good at and mine those competencies for all you’re worth. Do it and do it now. Err on the side of taking action. Communicate. Listen to your customers, associates and competitors. See and be seen. Get out of your office, walk around, make yourself visible and accessible. It’s more important to hire people with the right qualities than with specific experience. Customer needs may vary, but their bias for quality never does. Eliminate the cause of a mistake. Don’t just clean it up. View every problem as an opportunity to grow. Do I seek out and listen to different points of view? Do I make myself available to people at all levels of the organization? Do I actively manage how I am authentic? Do I encourage people to share information? Do I publicly admit when I am wrong? Do I update people regularly? Do I take the time to explain how decisions are being made? Early on in Eli Broad’s new book, The Art of Being Unresaonable, he reminds us of the power of a child’s instinctive asking, “Why not?” Unfortunately, most adults lose that habit and Broad goes on to explain that it was his continuing to ask “Why not?” throughout his career that brought him success. “The questions you’re willing to ask when others think they have all the answers are doors to discovery,” says Broad. Most successful businesses have to begin by bucking conventional wisdom. Invention and innovation don’t happen without it. Do your homework no matter how much time it takes. Big ideas don’t happen in a moment. You can’t do it all yourself, so ask questions and delegate. The trick to delegating is to make sure your employees share your priorities. Find the best people to whom you can delegate, and know their strengths and weaknesses. Younger employees simply have fewer preconceived ideas of what they can and can’t do. Try to widen their perspective, deepen their sense of accomplishment, and build their capacity. No matter how much money your customers have, they still want value. The best way to mentor is to challenge people and then to set an example by letting them see you in action. When you challenge people to dig deep and do more and better than even they imagined they could, it creates a particular bond. Show me a person with an unblemished track record, and I’ll show you a person who has dramatically underachieved. Broad’s book, subtitled, Lessons in Unconventional Thinking, is well worth the read. Broad is an entrepreneur, philanthropist, and the founder of two Fortune 500 companies — KB Home and SunAmerica. Thanks to the book’s publisher for sending me an advance copy of the book.